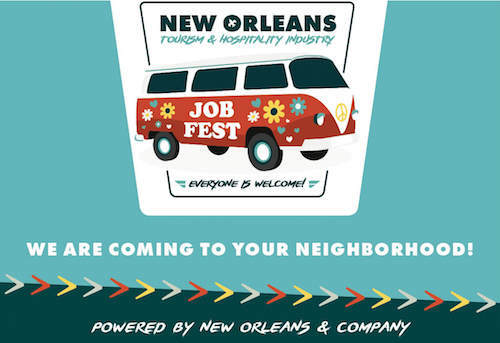 via New Orleans & Co.
New Orleans & Company is hosting its July Job Fest in partnership with District B City Councilmember Jay Banks and . The event is Wednesday, July 11 from noon to 3 p.m. at Dryades YMCA, 2220 Oretha C. Haley Blvd. Jobs include Electrical Apprentice for Audubon Nature Institute, Concessions Managers for the Zoo & the Aquarium, and more. Designed to be a one-stop shop for job candidates, Job Fest allows participants to meet with a variety of employers from hotels, restaurants, and other tourism fields. Participants can ask questions and learn more about the hiring process in a welcoming, one-on-one setting. The Job Fest is part of an effort to connect job seekers to careers in the hospitality and tourism industry across New Orleans. For more information, visit the July Job Fest site here.